The Variations derive from a CBC live radio broadcast performance of which Gould had a private recording made onto 33rpm acetate discs - no other copy is known. It first surfaced on a Sony CD in 1995 and has received a number of releases since then on various labels, including several on Sony. Each has suffered from a number of chronic defects, the most notable of which are pitch instability, piano tone and disc surface noise, swish, scuffs and so forth. Various engineers have had varied success in tackling some of these faults; this restorations aims to resolve as many as are now technically possible. For the first time the piano is pitched accurately and with much greater stability; tone is much improved; a plethora of intrusive surface noises have been either eradicated or diminished; general background noise from the disc is greatly reduced. There remains some unfortunate but mild distortion that is inherent in the recording, but overall this is an enormous step forward from previous issues, and what was perhaps little more than a curiosity can now be fully appreciated on its own terms as perhaps never before. The 1957 Partitas 5 and 6 were of course much better recorded, taped under proper recording studio conditions. Nevertheless some pitch issues between takes have been resolved here for the first time, and the piano tone has also benefited from XR remastering. Put together these two recordings paint a vivid picture of the young pianist, both live and in the studio. Eighteen twenty-nine was a major year in the history of Bach reception: That’s when Mendelssohn’s performance of the St. Matthew Passion led to a major re-evaluation of Bach’s standing. But you can argue that 1955 was just as significant: That’s when Glenn Gould made the first of his two studio recordings of the Goldberg Variations. 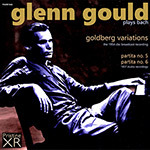 Whatever you think of Gould as a performer, it’s hard to deny that the spirited Bach of his early years had a profound and lasting (albeit complex) influence on subsequent performances, and that the 1955 Goldbergs in particular has served as a point of orientation for performers (especially keyboard performers) for over 60 years now. I can’t think of any other Bach recording—not even Casals’s recording of the cello suites—with that kind of aura. Gould hadn’t even hit his 23rd birthday when he made that recording. Still, it didn’t come from nowhere, and this live CBC broadcast from a year earlier gives us a kind of rough draft of the canonical performance to come. It’s generally slower (sometimes markedly so); in spots, it’s more conventionally “Romantic” (try the end of Variation 7); and it differs in detail, especially detail of articulation, throughout. But in its underlying outlook (in particular, in its punchy bass lines and the way Gould gives each contrapuntal line its own rhythmic profile), it clearly looks ahead to 1955. It’s therefore of supreme historical interest. Of course, claiming “historical interest” is often a way of damning with faint praise—but in this case, at least, the recording has enormous intrinsic interest as well. It’s a bit disconcerting to find your own words quoted at you in the program booklet of a CD—especially when they’re more than 20 years old. Fortunately, my enthusiasm for this performance of the Goldberg Variations, which is reprinted on Pristine’s reissue, has remained undimmed. Gould was famously allergic to live performance, which he abandoned mid-career—and it’s easy to assume that he didn’t thrive in front of an audience or away from the editing machines. And, I suppose, psychologically and ideologically, he didn’t. But in his idiosyncratic way, he was a charismatic stage presence—and as I’ve argued before (see Fanfare 35:4), his live performances (and that includes both his live broadcasts and his actual concerts) have a virtuoso sense of occasion that has always made me regret his decision to retreat from the concert hall. Certainly, listening to this broadcast, which almost paradoxically combines freshness (it often sounds as if the wonders of the music were being discovered for the first time) and self-confidence, is an unalloyed joy. It would be worth owning even if it were the only thing on the CD; the generous addition of the two Partitas—the bulk of a sensational studio disc issued the year after the Goldbergs—makes this scrupulously remastered offering that much more attractive. This article originally appeared in Issue 40:3 (Jan/Feb 2017) of Fanfare Magazine.